Christmas tree pretzel rods couldn't be easier! 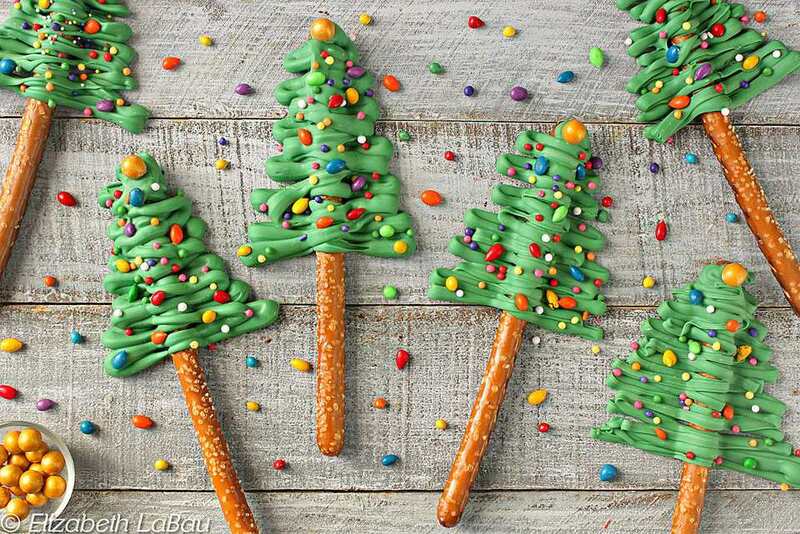 Drizzle green candy over pretzels to make these cute and delicious Christmas trees. This is a great candy for kids to help with—let them get creative with the decorative toppings like sprinkles, nuts, and coconut. Place the green candy coating in a microwave-safe bowl. Microwave in 30-second intervals, stirring after every 30 seconds to prevent overheating. Arrange the pretzel rods on a baking sheet covered with parchment paper or waxed paper. Transfer the melted coating to a large plastic bag. Snip a hole in the corner of the bag. Drizzle the coating over a pretzel rod in a tree shape: start about halfway up a rod, and make the wide base of the tree, gradually narrowing as you reach the top until it comes to a peak at the top of the pretzel. While the coating is still wet, sprinkle it with assorted sprinkles to represent Christmas lights. If desired, you can place a gold candy or star-shaped sprinkle on top. Repeat until all of the pretzels have been turned into trees. Refrigerate the tray briefly to set the coating. Store Christmas Tree Pretzel Rods in an airtight container at room temperature for up to a month.